Discussion in 'Online Games - News and Reviews' started by Kotsy, Jun 14, 2013.
video slot with kooky graphics and sounds. It's not your typical science lab. Enjoy wild symbols to build winning combinations, Scatter symbols for free spins, Bonus round and so much more. 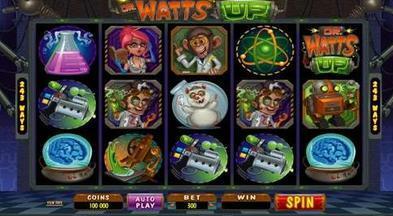 Dr. Watts Up is a 243 payline, 5 reel video slot. Minimum bet is .30. Based on your choice of coin size, which can range from 0.01 and 0.20 your bet amount can vary. The more you bet, the bigger your wins. All wins pay left to right except the Scatter symbol which can appear anywhere on the reels and the Bonus symbol which only appears on reels 1,3 and 5. The more winning symbols on the reels and rows within a winning combination can bring in some great money. Dr. Watts Up logo is wild and substitutes for all symbols except the Scatter Nuclei and Bonus Lab Rats. The Bonus Feature called Laboratory Bonus is activated when Lab Rats appear on reels 1, 3 and 5. A screen appears with test tubes and the player picks two chemical tubes to reveal a cash prize. You can either keep the prize or pick again. You can choose up to 3 times. Will you pick the big win? Or chance it?